Can you name The Benchman's Mystery Man? 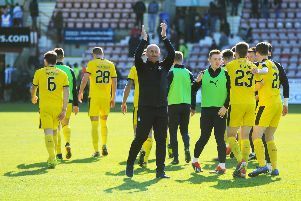 The Benchman has congratulations for Falkirk in the win at Alloa and for the Falkirk quiz team too. HANGING ON: How can you be so much in control and end up hanging on? Falkirk were absolutely cruising at 3-1 and yet it was the away fans that were whistling for time up. Alloa looked down and out and even their own fans were expecting the worst. As someone once said- it’s a funny old game. REALITY BITES: Alloa didn’t manage to field a full complement of substitutes. Why? Did they have enough shirts? Didn’t they want to put youngsters on the bench for experience? They were struggling with injuries and their two enforced changes in the opening 45 minutes could have cost them dearly. NOT SEEING RED: What do you have to do to get a red card these days? When Botti Biabi was clearly held back and he was impeded by the last man, even die-hard Wasps fans feared the worst for Ben Gordon. No- referee Anderson didn’t think it was a goal scoring opportunity and showed a yellow card instead. FREE OFFER: What on earth possessed the SPFL to agree to TV games kicking off at 5.30 p.m. during a major holiday period? Even the offer of free supporters buses wouldn’t fill the Dumbarton stadium. Surely they don’t want to see an empty stadium? Stand by for shots of the wildlife on the banks of the Clyde or close-ups of the winter moon. EXCUSES, EXCUSES: A wee bit of inside information about the Alloa pitch. Alan Stubbs the Hibs manager was very critical of the Recreation Park surface after their 2-1 defeat earlier in the season. Allegedly, the Hibs squad trained on that very same pitch from the Monday to the Thursday in the week leading up to the match. BROWN SHOE SHUFFLE: Have we solved the mystery of the Steven Pressley shoes? We thought that the ex-Bairns manager had bequeathed the brogues to the Sports Editor, but they seemed to have been handed (or should that be footed) down to Peter Houston. MANY HAPPY RETURNS: It was good to see Alex Smith back in action at Alloa on Saturday. The good wishes from every quarter of Scottish Football spoke volumes about the guy’s standing in the game. Even hard-nosed scribes in the press box acknowledged his return. FALKIRK LIFT THE CUP: Well done to the former players of Falkirk F.C. who won the coveted Quizball trophy. They saw off challenges from Hibs, Hearts and Dunfermline to go through the tournament unbeaten. The team was Alex Duchart, Tiger McLaughlin, Bobby Tasker and Ian Hunter. Among the many ex-Scotland players who attended were Jim Herriot, Peter Cormack, Alex Young and Billy Hunter. ANSWERS: Last week’s mystery pic was Peter Cormack of Liverpool, Forest , Hibs and Bristol City. The late Sammy Reid was signed from Liverpool.